If you have made it your resolve to catch up to and pass another athlete in front of you then you should listen to your instincts and go for it. The temptation however is to release a burst of energy and sprint to catch up to them as rapidly as possible. The problem with this strategy is that you will increase your heart rate quite dramatically and most likely burn yourself out by the time you catch them. A better strategy is to try to catch up to your competitor over a longer period of time at a constant pace. That way your heart rate will not increase as rapidly, thus leaving you in a more refreshed state by the time you pass them. The way to do this is to consciously focus on the back of their running singlet. Again, whatever your mind focuses on it will achieve. You will naturally find yourself drawn to your competitor, seemingly on autopilot. As you pass the half-way mark of the marathon, you may find that you start becoming frustrated at the slightest things such as a competitor appearing to be sitting directly on your shoulder, or the sun being at an awkward angle, or even just getting too plain sweaty. Becoming frustrated and annoyed can have a disastrous effect on your performance because it will cause your muscles to become tense and restrict your full range of motion. If this happens to you, realize that it is only because you are becoming tired that you are allowing these things to annoy you and that normally these external events wouldn’t even cause you the slightest bit of distress. Simply reminding yourself of this is usually enough to allow you to let go of the `annoying’ circumstance and instead focus on your race. If you are like most people, then you will generally find that if you are passed by another competitor then your form may drop off. 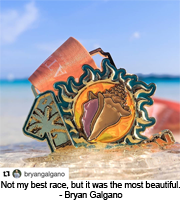 It’s because you are no longer focused on your race, but your mind starts to become aware that you have been passed by another athlete and starts to wander. This is natural. You may also find the same thing happens if you yourself pass another competitor. Because again, your mind is now focused on what you have just achieved and you are no longer focused on your race. Again this is normal. However, what you can do to regain your form is to imagine that there is a piece of string between the competitor that has just passed you, or the competitor that you have just passed. Then pretend to take out a pair of scissors and cut the piece of string. Doing this acts to break the mental link you have to the competitor and then allows you to focus fully on your race. You should start to see an instant improvement in your form. The Wall is one of the worst places you will ever find yourself during your race. 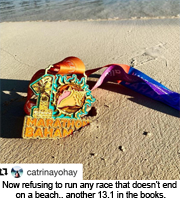 This is when your glycogen levels are at their lowest and it can feel like a struggle just to take one more step forward… let alone running another 5-10 miles to the finish line. If you have properly carbohydrate loaded your system and have gone out at your race pace then you should dramatically reduce your chances of ever hitting the wall. But, if you’re like a lot of athletes then if you do hit the wall then there are a number of things you can do. At this stage it is more of a mental game. Simply tell yourself that you are closing in on the finish line and that it is only a matter of time until you finish. This method works wonders because it lets your body know that there is an end to the pain. As your body becomes tired and possibly fatigued towards the later stages of your race, then you may find that your mind becomes negative. You will find that these negative thoughts leave you feeling even more tired and overwhelmed and your physical state will drop to even lower levels. To over come this, allow your mind to dwell on positive events in your life. Times when you felt strong and unstoppable. Remember how you felt. The way you were breathing and how that felt in your body. Allow these feelings to take over your way of being, until you are feeling these powerful feelings throughout your body. The more you dwell on these positive and powerful events from your past, the quicker you will regain your composure and strength… particularly in the later stages of your race. The problem is that all these thoughts may take you away from the real experience of achieving your goal… and when you look back at the experience, it may just seem like a blur. If you really want to ground the experience of crossing the line into your mind so that you can recall the experience at will whenever you want, then just tell all of your thoughts ‘Thanks for sharing’. This will make your thoughts seemingly dissolve into thin air. Then really focus on the experience of crossing the finish line… the people around you, the sounds that you’re hearing, the feeling in your body. Really experience what this is like for you. The more times you recall this experience over the next couple of days, the more it will be within who you are as a person. 7. The goal of your marathon training program should be to increase your weekly mileage to around 35-45 miles per week at around 3-4 weeks before your marathon. The reason for getting to this level is so that you can then implement a tapering period into your training so that you will be in peak physical condition for race day. If you are still increasing your training right up to the day of your marathon then you are not giving yourself the best chance to reach your potential in the race. You need a taper period to leave your muscles fresh and conditioned for your race. The idea behind training for a marathon is to condition your muscles and body to be ready for the race. This includes decreasing your resting heart rate and conditioning your muscles and respiratory system to function in the most efficient manner possible. To do this you should schedule your training sessions to allow your body to push to it’s limits whilst at the same time allowing it enough recovery time between sessions. This is the most efficient way to get your body into peak condition without running yourself into the ground. As you progress through your marathon training program you will find that it is your long training sessions that most of your fitness comes from because your body changes it’s physiology as it is pushed to it’s limits. If you push too hard during these sessions then you will run the risk of injury and it will also find your recovery time will need to be extended or else you will start to feel flat and lethargic during the day. So how do you stop yourself from pushing too hard during your longer training sessions? If you have access to a heart rate monitor you should keep your heart rate to between 60%-70% of your maximum heart rate. That way you are allowing your body to push to it’s limits whilst at the same time allowing your body enough room to recover. 8. In the week before your marathon there are some special precautions and preparation that you will need to make. Physically you should aim to shift your focus on remaining loose and comfortable by stretching more than you otherwise have. Avoid, however the temptation to overstretch, as this could cause slight tearing of your muscles and throw your whole marathon preparation in jeopardy. Psychologically you may also be finding it tough inthe last week to get your mind around the fact that you are training less in this entire week than the actual distance that you are going to cover during your race. The easy way to counter this is to accept at this point and believe in the months of training that you have done in the months leading up to the marathon. Remind yourself that this is a period that you should enjoy because you body should literally be bursting with energy. 9. On the actual race day there will be a number of items you will need to take with you. If you are like most first time marathoner’s you will scramble around on the morning of your marathon trying to make sure that you have everything. This will put you under undue stress that you really do not need after so much preparation. So how do you prevent this? Make a list. Simply make a list of all the items you will need to take along for your race, such as training shoes,race number, plasters, sports drinks, power bars etc. Then in the week before your race, make sure that you review your list at least three times to triple check you have everything you need for your marathon race. The night before your marathon, you should pack everything you need in your traveling bag. That way, when you wake up on the morning of your race you know that you are fully prepared for the day ahead and not get stressed out thinking that you may have forgotten something, giving you the best chance to perform at your potential. Most marathoners go out way too hard during their marathon. The reason is because they are feeling good at the start line and start the race depending on how they are feeling. This is one of the worst tactics you can use as a beginner marathoner because you will blow up in the later stages of the race as your heart rate begins to soar. A better way to pace yourself is to work out your splits for the 5, 10, 15, 20 and 25 mile marks. Simply work out what you predict your final time to be over the full distance and work backwards to find out your predicted splits at these mileage points. A little tip is to then write these times down on the back of your hand (not the palm of your hand, because it will rub off with all the sweat) and then aim to pass the mileage marks at these points. You should also aim to run the first 5 miles so that it feels like you are running way too slow. If you are say 60 seconds behind your predicted time for the 5 mile mark then you can slowly increase your pace with no great problems. However, if you are 60 seconds below your predicted race pace at the 5 mile mark, then you could be in trouble in the later stages of your race. If you have no idea what race pace feels like, then you can work out your race pace over a 400m distance and aim to run these splits in the lead-up to your race on your shorter training sessions. This will subconsciously ground race-pace into your system so that you can tap into it in the initial stages of your marathon. You should aim to make your longer training sessions to simulate your race as exactly as possible. you should have a large carbohydrate meal the night before your marathon and have an early night. You should mentally prepare the night before and walk yourself through the exact steps you are going to take the next morning. You should get up early on the morning of your longer training session and have the exact meal and preparation you would do for the actual race day. Do everything exactly as you would for your race day, even pretending to attach your numbers to your singlet before you head out the door. Mentally rehearsing like this will decrease your nerves on the actual race day because you are following the exact steps in your training. When it comes to race day then you will know exactly what you are meant to do because you have simulated it so many times during your preparation.